These don't have to be just for wedding decorations! These centerpieces are great for birthdays, anniversaries or other special events. Contact us for custom designs. These monogram reception centerpieces are perfect as is or perfect for the DIY bride to add her own special touch to make a totally customizable centerpiece that will truly stand out. Turn your wedding reception table centerpieces into something worthy of being the center of attention and a marvelous conversation piece. 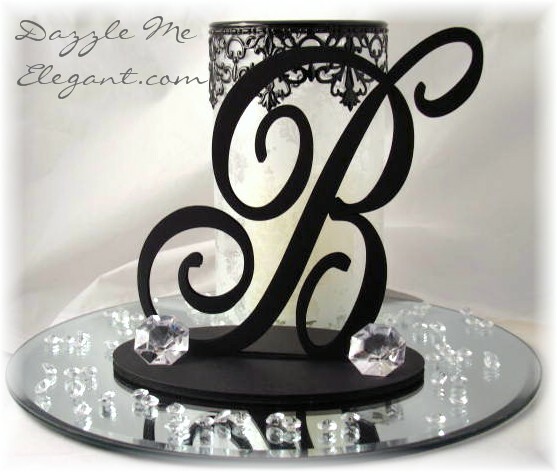 The large Monogram Centerpiece measures 8" tall and 8" wide 1/4" thick and comes with a matching base (base size may vary due to letter/font selection). They can be unfinished - not painted, black, metallic silver or metallic gold. They are made from sturdy wood. Need a custom centerpiece? Contact Us for a quote. 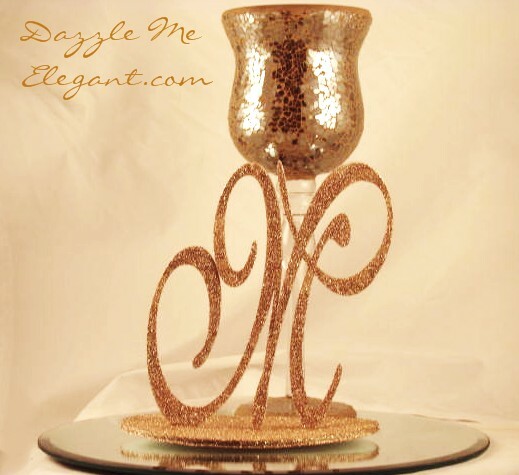 ...with a little imagination turn them into the perfect DIY Monogram Centerpiece! Don't have time, we'll do it for you...click here!